The Arthur Amish community occupies a special place with me. This was where I first really got to know something about Amish people. As an outsider who knew nothing about them, I never intended to “study the Amish”. I could scarcely have had any idea where things might lead when I knocked on that first Amish farmhouse door ten years ago. As I tell in the foreword of my Amish business book, I first met the Amish while selling books in Moultrie County, Illinois in 2004. I spent about three weeks in the Arthur community that summer. Over that time the Amish went from strange to familiar pretty quickly. 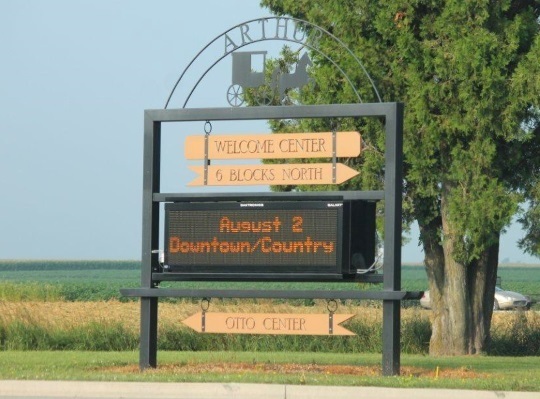 With a population of 2,288, the village of Arthur is similar in size to Kalona, Iowa. 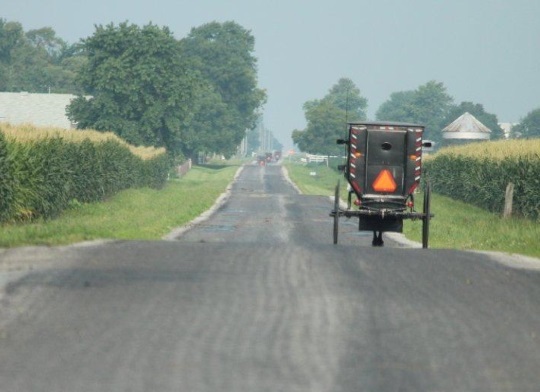 As in that community, you’ll find Amish living in just about any direction you go from town. 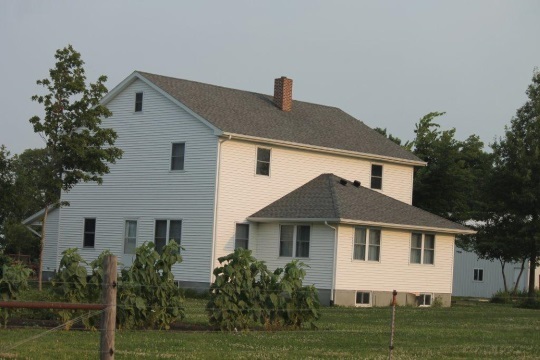 The Arthur Amish settlement was also founded around the same time as the Kalona Amish settlement, in 1864. Unlike Kalona, however, Arthur is much larger today, at 29 church districts (around 4,000 people) versus 10 in Kalona. There is also a modest Amish tourism industry in the village. Early settlers to the Arthur community came from states including Pennsylvania, Indiana, and Iowa. 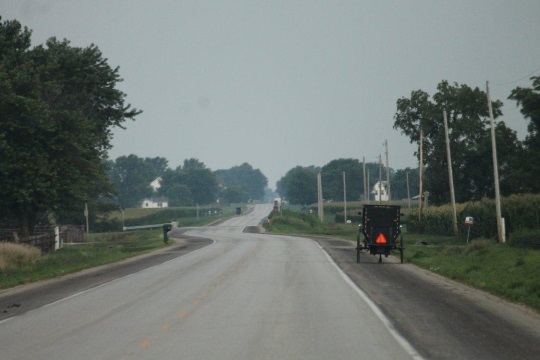 Also like the Kalona community, the Amish showed up here before the town did. 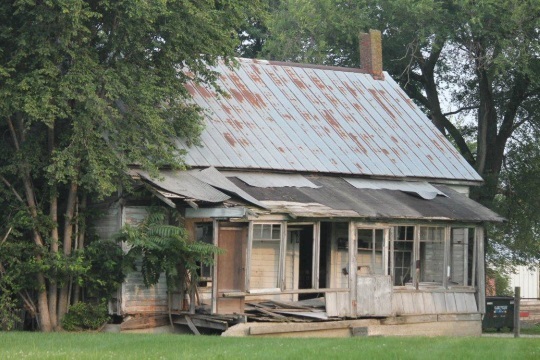 Arthur itself emerged in the early 1870s, developing as a settlement centered around a railroad switch track in swampy territory between Arcola and Decatur. “Swampy” is not how I’d describe the lands surrounding the town today, covered by fields of corn and soybeans and dotted with Amish homes for miles. According to the village website, the settlement eventually took the name of the railroad owner’s favorite brother. The photos today were taken by contributor ShipshewanaIndiana, who visited Arthur last weekend and is quite familiar with the community. According to The Amish, there is an “Arthur” affiliation, made up of just 4 settlements in 2 states (the largest by far being the Arthur settlement; see p. 139). You find some Amish family names here that aren’t often seen elsewhere, such as Otto, Jess, and Diener. Schrock is not one of them though. That’s a fairly common Amish surname. In terms of population growth, the Arthur community has lagged. According to data in The Amish, the Arthur affiliation only increased in size by 66% from 1991-2010 (see p. 153). This compares to an 88% growth rate in the Elkhart/Lagrange affiliation, 102% for the Lancaster communities, and 171% for the Swartzentruber Amish. One reason may be smaller families. Also in The Amish, we learn that Arthur families average 5.9 children, versus 7.0 for Elkhart/Lagrange, 7.2 for Lancaster, and 9.3 for Swartzentruber churches. They’re near the bottom of the 16 groups surveyed (p. 157). Any guesses why that might be? 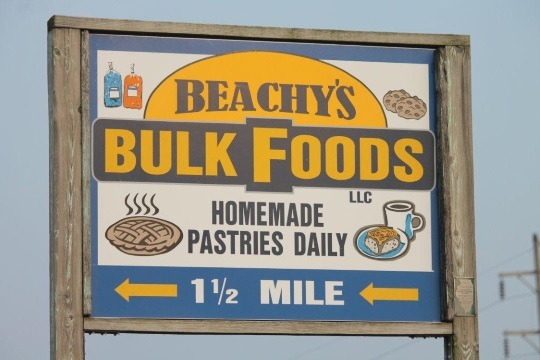 Small businesses abound in the Arthur community. 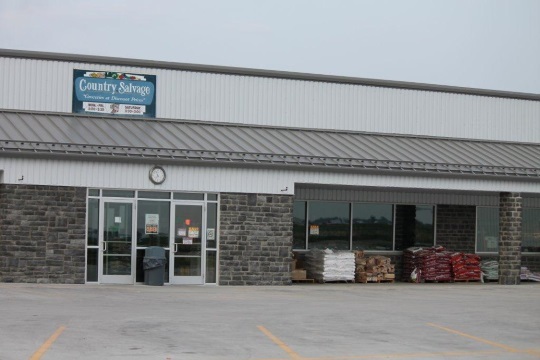 Here are two food shops. I spoke with an Amishman in central NY last week who shared a pretty common sentiment. We were talking about how some in his community had moved into business. He said something like “they make people faster than they make land.” Can’t dispute that. Arthur’s in a pretty good place for business. It’s 2.5-3 hours to Chicago, Indianapolis, or St. Louis. We don’t have any photos of them here today, but wood businesses are common in Arthur. These buggies are pretty reflector-heavy, don’t you think? These may look like something youth might drive, but that’s not necessarily the case in this community. Those are buggies driven by church members. 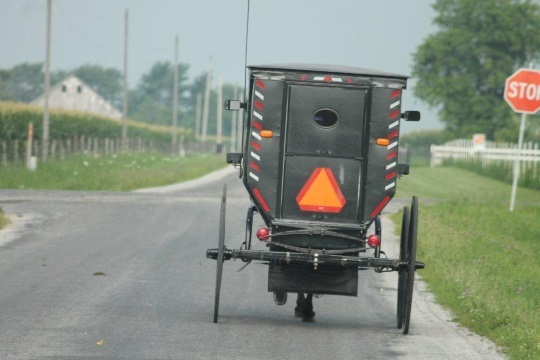 I did see one rumspringa buggy driven by a male youth that had a dream catcher in the window. Varied sequences of reflectors were the norm on buggies when we lived there. Reflectors are in Arthur what LEDs are in Elkhart-Lagrange. I once asked my neighbor in Arthur how he picked his buggy out of a parking lot full of buggies and he said he recognized it by the reflector pattern. I can see how reflectors are the first thing to which your eye is drawn. This view brought back memories for some reason. I think it’s the jog in the road. A simple lighting solution. But one without a switch. I’m not sure anyone lives here. 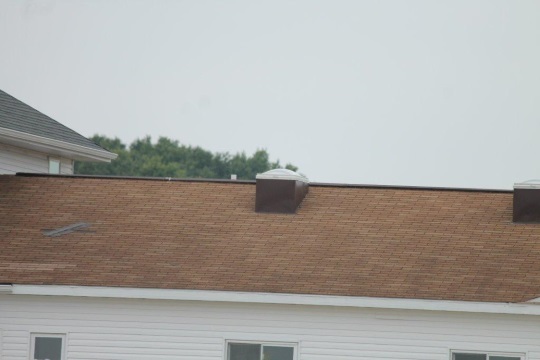 In fact there might be a few unintended skylights in that roof. Another business. The sign below confused me a bit. Closed on Sunday and religious holidays. 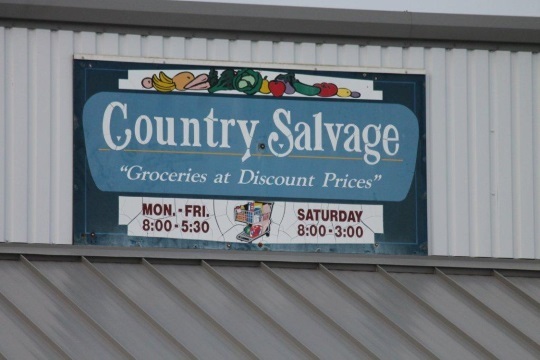 But only open Thursday-Saturday? Maybe Monday through Wednesday are “flex” days. 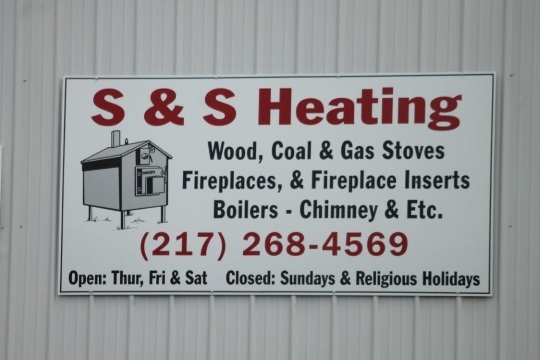 We’ve seen an Amish stove shop here before. 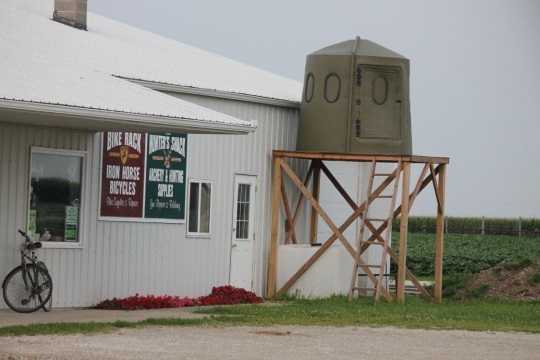 Amish businesses do take credit cards. Some of them do, anyway. 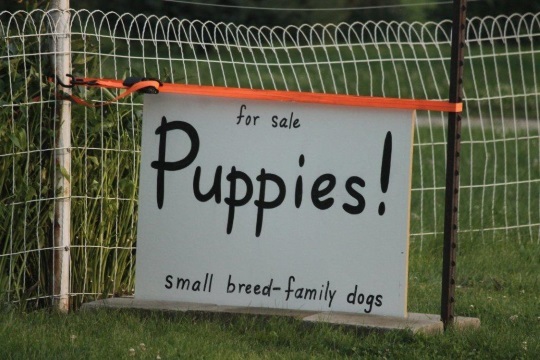 Puppies are another business you sometimes see. The reputation of Amish dog breeders has been stained by some truly awful puppy mill stories. Though it’s been a while since I’ve seen one of those in the news. I wonder if these folks have gotten any grief for their business. The sign sure looks friendly (is that the Disney font they’re using? ), but who knows much beyond that. Of course it goes without saying that not every breeder is a puppy miller. Including “family dogs” in the description suggests they might be sensitive towards common complaints against the mills. 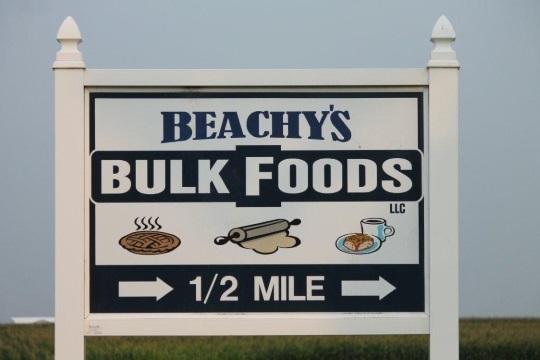 Maybe this business is oriented towards raising dogs like family pets rather than livestock? Recreation comes in many forms. 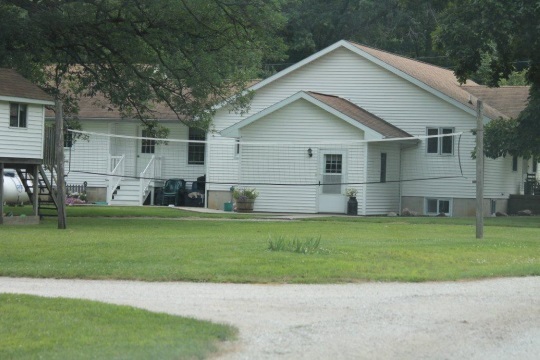 We see a few of the recreation options for Amish at Arthur below. This business has two points of focus: bikes and hunting. 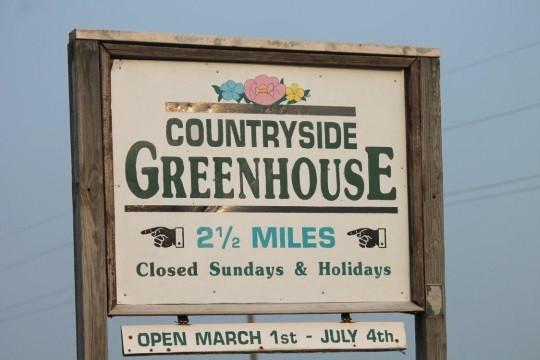 Is their clientele more English or Amish? I don’t know much else about this shop, but I’d guess Amish. Volleyball is a youth favorite. We’ll finish with what for me is the most puzzling photo of the batch. Do my eyes deceive me or is this an old antenna rolling down the road to destination unknown? Hmmm. Could possibly also classify this pic under “recreational activities”. Also, do you notice anything odd about the buggy itself? 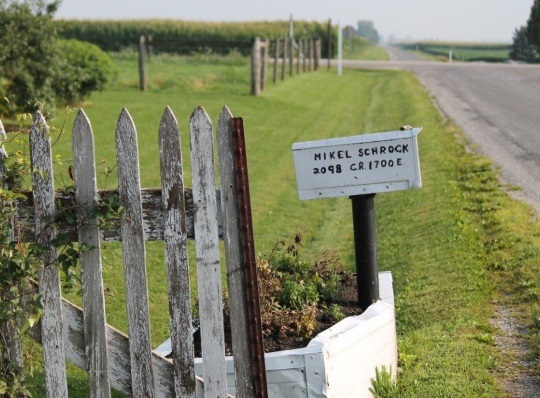 I hope you enjoyed this glimpse of Illinois’ largest and oldest Amish settlement. Center and I’ve had many good meals there when there happens to be a benefit dinner or auction going on. I like your description of the community Al. Looking back that is the sense I get of the place. It’s a big community (7th-largest) but still has an off the beaten path feel, probably due to the relatively low tourism. I wonder what I’d notice to be different ten years after my first visit. Hallo from Germany ilike Mennonites and Hutterities. Hier in Germany gibt’s das leider nicht schade. 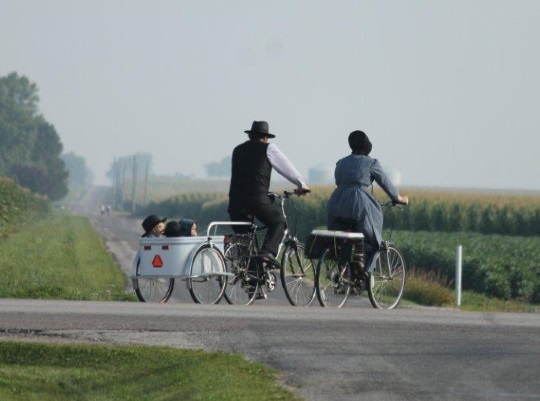 about my adventures with the Amish, Mennonites. population” about the real Plain People. Thanks for posting this! I enjoyed it since Arthur is one place I haven’t been! Just for the record – Diener is a name found in Lancaster as well. I’m not a German speaker, but Diener is the word used to describe Amish ministers, and literally means “servant”. More on that in Amish Society p. 106. This looks like it would be a nice place to visit and do some shopping. Thanks for sharing all the great pictures with us. The back windows on that last buggy are different. Thanks for the great photos! show up. Amazon has many. The last buggy looks flat to me. I’m also curious, although, I’m sure there is a reason why I can’t see one, but is there no horse? 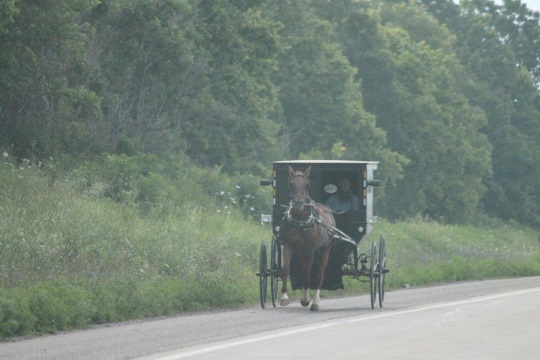 I’m pretty sure the horse is there (unless it’s actually one of THESE special models: http://amishamerica.com/horseless-solar-powered-buggy/ ). It has to do with the buggy itself. Arthur was the first Amish community I ever visited. This was probably close to the time you were selling books there, Erik. We actually stopped in Arcola first, for the annual Broom Corn Festival (foolish me–I didn’t buy a broom! I should have!). At the time, it was touted as the “broom corn capital of the world.” We also saw the “Hippie Wall of Fame” (or whatever its called), by the train depot. Who knew?! When we drove into Arthur, I was taken by the “squareness” of the country—farms/roads laid out in a very even grid (much like Chicago, it seemed to me). We stopped at a small (I believe it was run by a Yoder family) store, where you could buy pieces of homemade soap by the pound (odd pieces & hunks), as well as some tasty pumpkin butter and jams. There was a sign on the wall touting an “apple cider vinegar” diet plan. I was surprised by that! A visit to an Amish furniture shop had me drooling! I managed to buy something there–not much, but I used a credit card (they had the old manual credit card machine)…a handmade wooden postage stamp dispenser that looked like a rural mailbox. Still have it/use it today. I was impressed by how light it was in the store, without “lights”—just skylights, and kerosene lamps at the ready for cloudy days. Saw some Mennonite women (small floral prints in their dresses) at the dime store in Arcola. My husband and I walked a bit in Arthur, where a little Amish girl stood in front of a house. My husband said “hello” to her more than once. She just smiled. I realize now that she probably didn’t speak English yet (she was probably only 3 or 4). Thanks, Shipshewanaindiana, for bringing back memories, and to you, Erik, for your own reminiscences! Sure hope I get to go back there sometime! Not sure about the buggy, other than some additional “lights” and yes, squareness of it. As for the antennae, I’m guessing it may be repurposed into something else much more useful to plain people. I think you and Shom are on the right track here, if you look at the back outline, the buggy is actually not a typical style for this area, it looks like an Indiana style buggy. 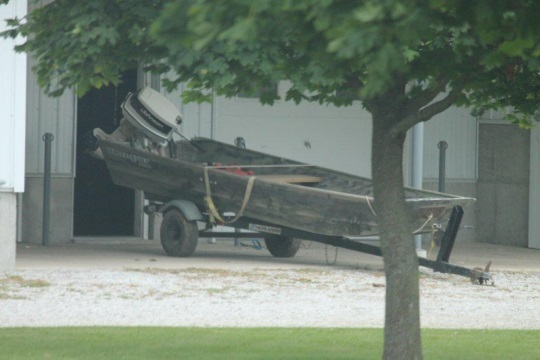 Our photographer and I speculated it might have been someone who moved to Arthur from northern Indiana. I think I’ve tried that apple cider vinegar before–except I got it is an Amish home remedy when I was ill. Strong stuff! Ah, my favorite place to visit. Thanks for sharing the photos and stories. Unfortunately I have not made a trip there yet this year. I have been battling cancer since early in the year. They did get it with surgery and now I am heading into radiation treatments just to be on the safe side and make sure it does not come back. Hopefully, I will be able to make a trip this fall before winter decides to arrive in Central Illinois. Alice, I didn’t know of your illness. I’ll keep you in my thoughts & prayers as you undergo radiation. I have a number of acquaintances as well as a sister who have been cancer survivors for 12+ years. I hope to be reading your comments here for a long time, so keep plowing ahead! I hope your visit to Arthur is a fun one, whenever it happens! By the way, do you have a favorite “venue” in Arthur, either for shopping, dining or visiting? I wish you a speedy recovery! Thank you Alice Mary and Erik!! I am doing pretty good, the worse is behind me. The radiation is just a precautionary measure to be on the safe side. 🙂 I got “measured” for the radiation treatments today and they will call in a week to 10 days with a schedule of 5 weeks, 5 days a week treatments, then a little recovery time and I should be better than new!! I just thought of something. Can Erik or Shipshewana answer this. 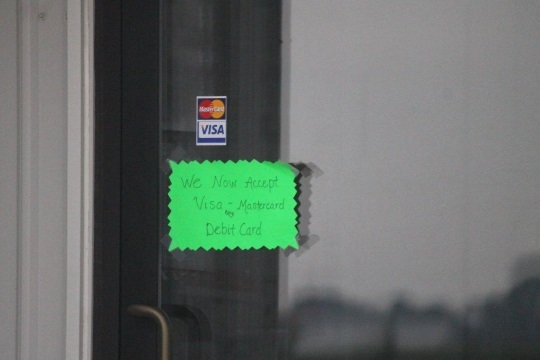 The “Visa / Master Card” sign on the window of the Amish business that now accepts both, is there any chance that the store that this was taken at was previously owned by an English business owner who used the card, or was that a really new sticker. If I were a business owner, I certainly wouldn’t leave up a sign in such a visible place saying I took credit cards if in fact I didn’t…so I’d say the chance of that scenario is basically nil. A place like Arthur is progressive enough that it’s not surprising to see Amish businesses equipped to take credit cards. New spins on an old slogan...? 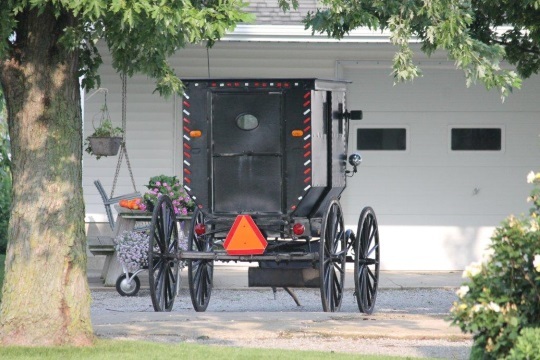 Amish Express — Don’t leave your buggy without it? Have you checked out Rockome Gardens lately? The Restaurant is great and we have Bluegrass this weekend. The TV (?) antenna really caught my attention. “Repurposing” that someone mentioned above certainly sounds viable. But being that we can’t tell if there is anything else in the trailer I have to wonder if they could be hauling a load of scrape metal to sell. I know if I saw the same thing in a pickup truck bed ’round here that’s one of the first things that would come to my mind. I agree with Don. My guess would be they are taking it for scrap metal. If you have been to any rural estate auctions you will see people bidding on anything metal. They’re not buying to use it, they want it for scrap metal. 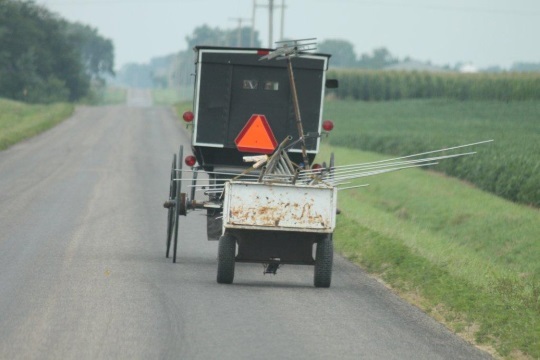 Perhaps, these Amish bought a house and the antenna was lying around so they are going to take it away and make money at the same time. 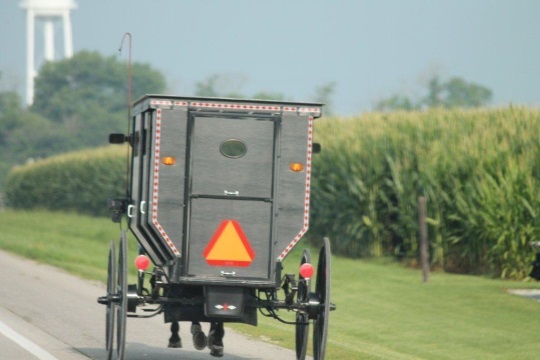 I live in an area with a lot of Amish in the Elimsport area of North Central, PA. I enjoy observing and talking with them. When I was a kid and we saw them at livestock auctions, my parents would call some of them Dunkards. I know they aren’t all Dunkards in the area now. You see a variety of rules depending on the district and their local bishops. Some have cell phones, some aren’t allowed, some use more modern equipment, some don’t, some use a forklift after dark but not during the daytime, some use electric fence while others don’t, it all depends on the branch and local district. Arthur, IL is my hometown! Thanks for the nice photos…I recognize where some of them were taken! It’s fun to see articles like this and find out what others think of the Arthur area.